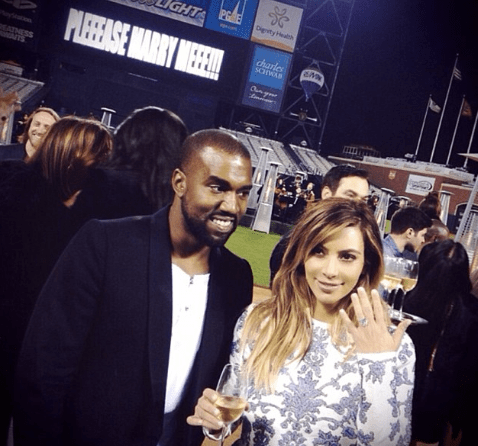 And who has better engagement ring bling than the rich and famous? all you need to do is get in touch with us to come up with the perfect idea! 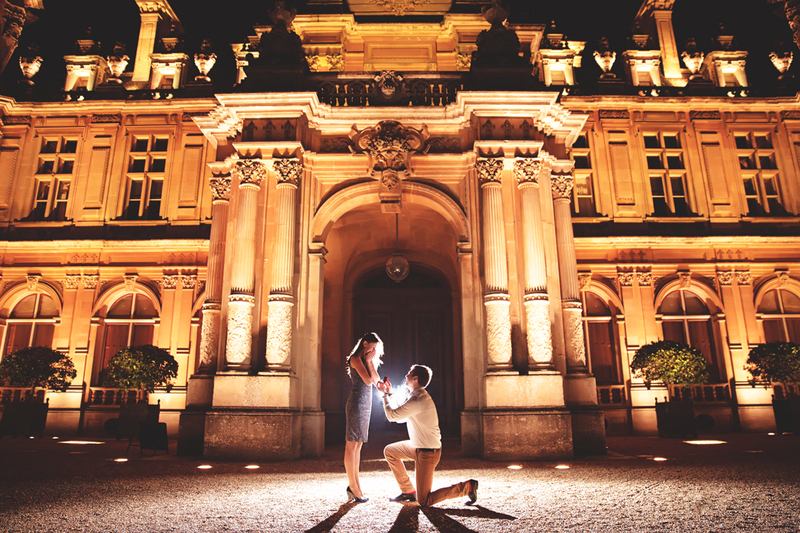 So we thought we’d give you all a bit of inspiration, we’ve found some of our favourite celebrity proposals to give you some ideas of how you may like to pop the question! An engagement ring and a delicious meal what woman wouldn’t want this? 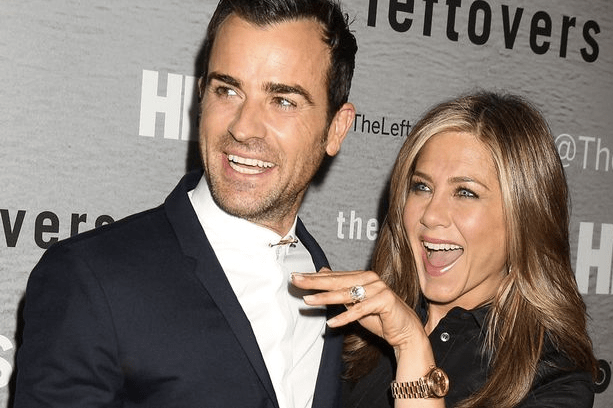 Justin Theroux supposedly made Jennifer Aniston cry when he proposed at their favourite restaurant, New York’s Blue Hill. Here at The Proposers we do lot’s of restaurant proposals but not many people know most top restaurants have their own private dining room, perfect if you want it to be intimate and away from the prying eyes of other diners! With all of the family! 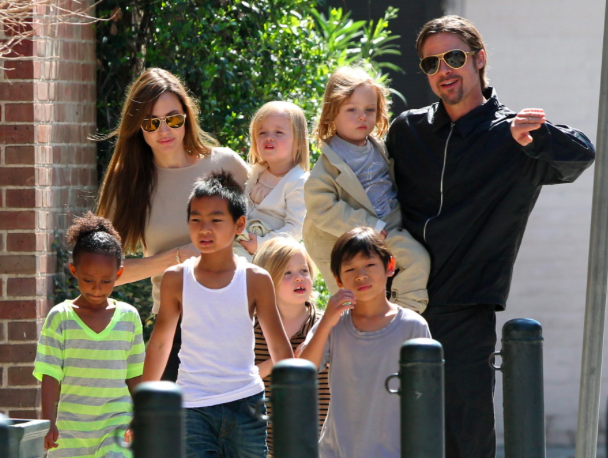 Brad Pitt made it a family affair, asking Angelina Jolie those four famous words in front of their six children. Including your families in an engagement is a super popular way to get everyone involved! That’s one big brady bunch! We think having your family there is a great idea, we’ve done proposals with GIANT minions for the kids and even a magician to keep your young one involved!! Alternatively how about having your family and friends hiding to wait and hear that all important YES, once you’ve had your private moment they’ll come out and toast you with Champagne! In this proposal we created in Greenwich Park little Isabella was a part of her parents big moment!!! Some may find a Valentine’s Day proposal a bit cheesy, but it worked for Snooki and Jionni LaValle. This is our most popular day of the year!! This Valentine’s The Proposers managed to pull off SIX proposals!! They were all completely different sizes and budgets one lasted two whole days and one was even in Rome! Mete & Bercis – Does it get more romantic than proposing in ROME on VALENTINE’S DAY!! Ellen DeGeneres famously proposed to Portia de Rossi in 2008 with a diamond ring while they were tending to a pet goldfish. Now at The Proposers we’ve done all kinds of proposals involving pets from dogs dressed up as Disney’s Prince Charming, to Pony rides through the snow and we’ve even had cats deliver the ring at Dinah’s Cat Cafe! 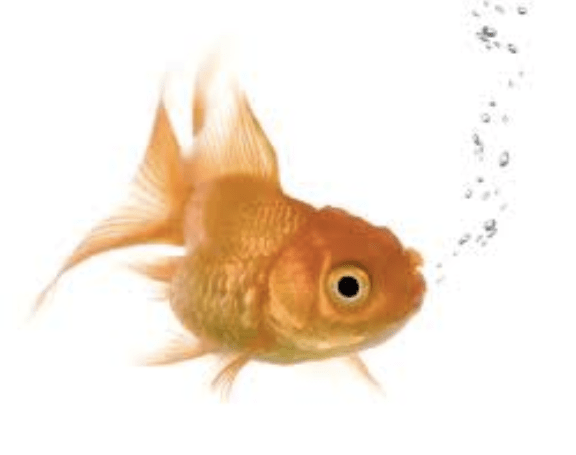 Just remember animals can be tricky to work with, and they may not always do exactly what you had in mind…we hope Portia’s goldfish did well in its starring role! 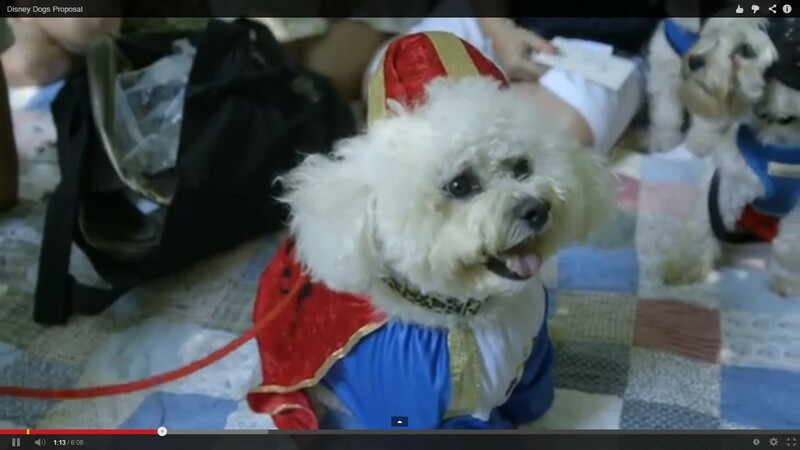 How cute is Monty dressed up as Prince Charming in the Disney Dogs Proposal we created!! A change of scenery can make an engagement much more exciting. Tom Sturridge asked Sienna Miller to marry him by filling a hotel suite with flowers in Paris. They clearly love Paris just as much as we do! We see TONNES of people getting engaged on holiday, both couples coming to London from abroad and Londoners travelling to anywhere from Paris to Zanzibar. Remember we can help with proposals all over the world (especially since we opened our new office in the UAE)!! 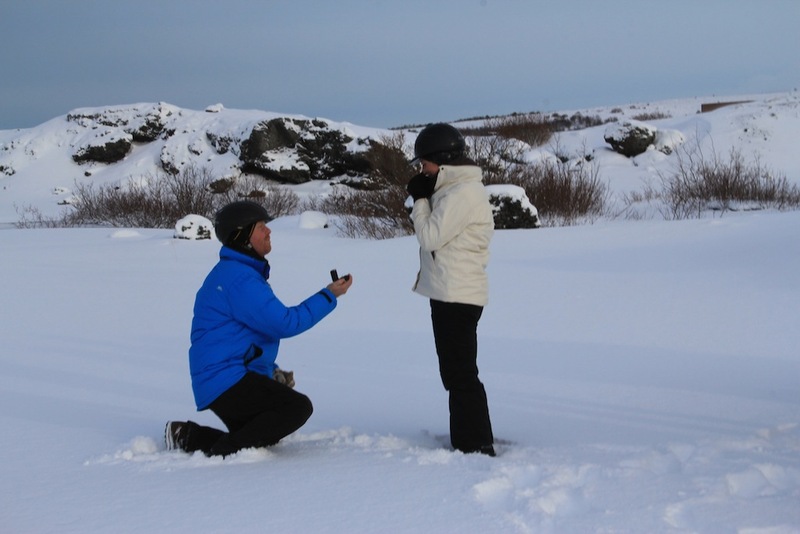 The Proposers have even created a proposal in Iceland!! It’s hard to top Kim & Kanye’s Baseball Park proposal complete with live orchestra and all her friends and family waiting in the pitchers! If any of these proposals have inspired you or maybe you want something that has never been done before, you know where to come for help, ideas & advice! !